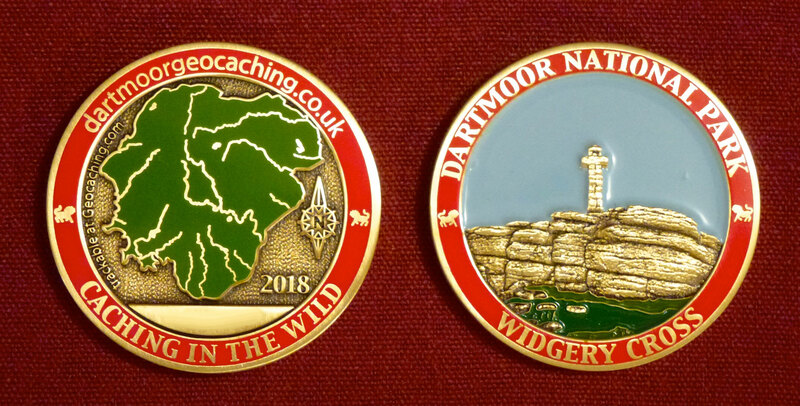 As many of you will have realised I have now received the 2018 Limited Edition Dartmoor Geocoins and should be able to start sending these out immediately. You may recall that last year there was a dramatic increase in my costs of over 30% because of rising production costs and the very poor exchange rate. However, I only increased the cost by £1 for the first coin and actually reduced it if you bought more than 2. I am happy to offer these same 2017 prices to you for the 2018 geocoins. Therefore the costs for 2018, 2017 and 2016 coins will be £14 for the first coin but only £12 each for ALL additional coins. The cost for 1st class p&p will be £2 for 1 or 2 coins and £3 for 3 or more coins. 3 or more coins will be sent 1st class signed for. These postage costs are identical to last year’s. There is a dwindling stock of both 2014 and 2015 coins and the cost for these years will be £15. However, if you wish to buy a complete set of 5 coins the cost will be just £65 including p&p – a saving of £6. As in previous years, if you wish to purchase a second coin to be entered in the 2018 race I will offer a £4 discount, so it will cost £10, a total of £24 for both coins, plus £2 p&p. But please, please do enter the race coins in the race! Each year there have been those who have bought coins at the reduced rate and never released them! If you wish to purchase any of the coins, please let me know using either of the facebook groups or reply to this post at the bottom of the page. I shall be working my way through the orders in the order I receive them and sending out PayPal requests. I will require an email address, so if you know I don’t have yours please send it to me using an email to davidgmartin@me.com or using a private facebook message. If you have bought one previously or have signed up to this web site, I will have it already. Many, many thanks to all who will be purchasing the Dartmoor Geocoins this year. Hi Dave – could we have a 2017 coins please. Many thanks. Hi Kevin, Don’t you want the 2018 one?? ?